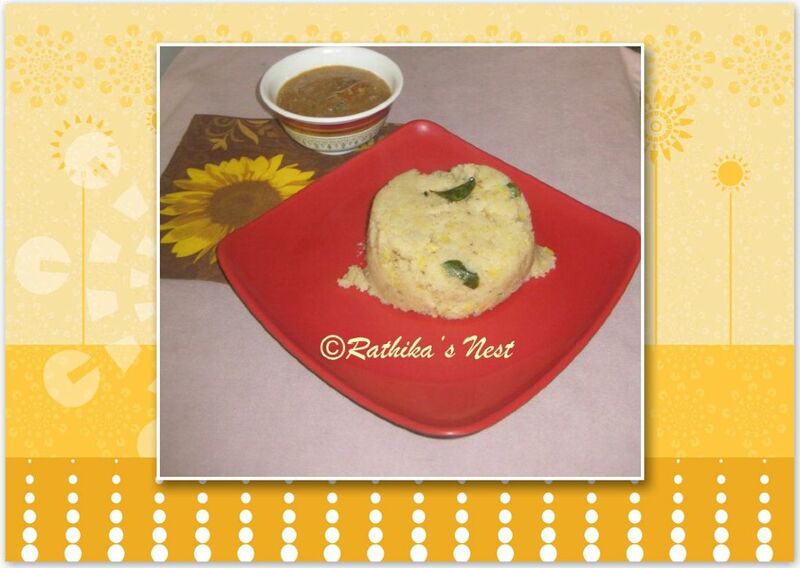 Rava pongal (ரவா பொங்கல்) is a traditional recipe and my aunt used to make it often. This is a type of pongal in which rava or semolina is used instead of raw rice. It is tasty and filling, and can be prepared for breakfast or dinner. Let’s see how to make this pongal. Method: Heat 1 teaspoon of ghee in a kadai and fry moong dhal till it turns light brown. Add ½ teacup (100 ml) of water and cook on low flame till the dhal is cooked partially. Add more water if needed. Once the dhal is ready, switch off the stove. Coarsely powder jeera and pepper; Keep aside. Roast rava in another kadai till it turns light brown and transfer to a bowl. Boil 2½ teacups of water with salt in the kadai. When it boils, add roasted rava little by little without forming lumps while continuously stirring at the same time. Add in the cooked dhal, remaining ghee, jeera, pepper, curry leaves and grated ginger. Mix well, cover and cook on low flame till the rava is cooked well. You may add 1 tablespoon of split cashew nuts fried in ghee if desired. Mix well and serve hot with coconut chutney, sambar or brinjal-onion kothsu.